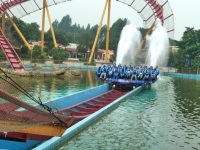 The Chimelong Group is the leading park operator in China, offering a variety of attractions including a circus, a waterpark, and a theme park. Chimelong Paradise Amusement Park is one of China's largest theme parks and it is recognised internationally as a quality establishment, with one of its rollercoasters even being featured in the Guinness Book of Records! The park has more than 100 rides and is guaranteed to delight thrill seekers and kids of all ages. The water world section boasts one of the largest water stunt shows in the world and is a famously enjoyable place to spend a sunny day. The Chimelong International Circus is said to be the world's largest permanent circus and the theatre can hold nearly 7,000 people. This show is endlessly popular and it is recommended that visitors book their tickets in advance, especially if going over the weekend. This can be done online. The Chimelong International Circus includes award winning acts from all over the world and its set, lighting, and costume design is fantastic. The Chimelong Park and circus top the list for families when it comes to things to do in Guangzhou.